Another day in the paradise of New Eden. Nearly all of my adventures begin this way. 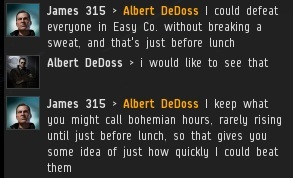 After Albert DeDoss introduced himself to me, I began bumping his Retriever out of the ice anomaly. The locals started giving him advice. Highsec miners have a lot of hang-ups and issues that need working through. One of their biggest problems is that they're not very good communicators. They say one thing, but they mean another. For instance, if a miner says he won't pay, he really means that he won't pay until he has been bumped for a longer period of time. Albert vowed to stop me, so I challenged him to try. If this were some cliché story, this would be the part where Albert fights back and saves the system from the evil overlord. But this isn't that kind of story. Going through the "let someone else handle this" phase, Albert suggested that his merry band of friends would stop me. It's something that carebears frequently think of. Unfortunately, there are two problems with such a plan: First, highsec mercenaries, to the extent that they exist, are all useless. Second, carebears can't actually summon them. When Albert realized that I wasn't intimidated by his friends, he instantly abandoned the idea and went for plan B. Yes, it was counter-bumping time. I sat still and let his Rifter bounce off my Invincible Stabber so I could take a picture. 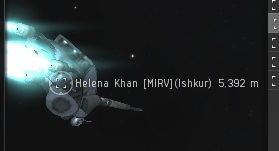 Helena Khan decided to help out, and joined the effort with her Ishkur. Like the "I have scary mercenary friends" strategy, counter-bumping has two weaknesses: First, it doesn't work. Second, it looks silly. 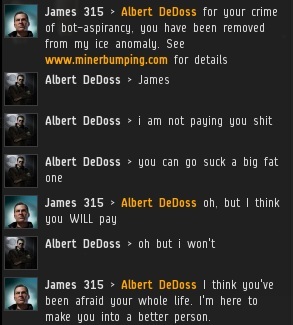 It began to dawn on Albert that despite chasing me around in his Rifter, he wasn't able to prevent me from bumping other miners out of the ice anomaly. His solution was to recruit more counter-bumpers from the local population. A small counter-bumping militia formed on the spot. To my delight, they sent a pair of Nighthawks after me. It's so rare that I get to see command ships used for counter-bumping. What a treat! One thing I appreciate about counter-bumpers is how easy it is to photograph them. They use the "approach" command, so just sit still and wait for them to come to you. After bumping Soolin Spanner's Mackinaw out of range, I took up a position nearby. The Nighthawks were joined by a Cerberus while I posed for the camera. Given the fact that people have tried and failed to counter-bump me for nearly a year now, it's safe to call it an act of desperation. Yet it's almost a kind of rite of passage. Before a rebel miner can learn to follow the Code, he must take a random ship and literally follow me around the ice field. How symbolic! I came to this blog with a rather negative impression of you James 315, but I cant help but be won over by your polite demeanor. You're like the Mad Hatter with a Stabber. Whilst I don't like to think of EVE losing potential players no matter how misguided due to another players actions, you are very entertaining. "Whilst I don't like to think..."
Luckily for you, you rarely do. 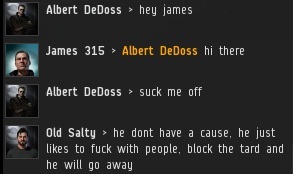 It was James 315's shenanigans that persuaded me to re-subscribe to EVE. This is indeed why I picked up EVE as well. Many good players join thanks to the New Order. Good players, who want to create content and understand that this is a game that relies on risk and losses to provide meaningful gains and victories. Players who quit because of the New Order do nothing but leeching resources without interacting with anyone, they get angry if they have to abide the game's rules about risk and losses and act rudely on chat. It's good for EVE to lose those players. Good miners don't act like that. First rule of EVE: if you can't defend what you have, it's not yours. If you disagree with this rule, it's better for you and for the game that you quit. Just think...if those counter bumpers had brought ships that were actual suicide gank threats, they might have been able to chase James off. 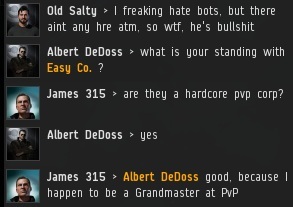 Awwwww, it's so cute to see all the bot aspirants out of their barges and exhumers playing make believe pvp in big boy ships like grown ups :) Working together, following the kitchen sink doctrine, maybe one day they will grow up to be goons. And they look like they had so much fun playing pvp too. Let's hope they learnt something from this play day. James you truly are one of the best care bear carers in Eve for arranging this exciting outing for the little uns. Your services to the community speak volumes for the vastness of your all encompassing love. Also I am humbled by the skill with which you can take a group of bot aspirants, get them to cast aside their mining vessels, get them to reship, and attempt to work together, all in compliance with the goals of the code and New Halima Scriptures, whilst they are blinded by open opposition and denial of said code. The sugar to top? They believe they won. That takes real skill and understanding of the clone psyche. Awwwwww... it is so cute to see a site totally dedicated to PVP-aspirant former WoW players taking out their childhood bullying issues out on other players. Using "ex WoW player" as an insult makes you very cool!! Also, you're the one who has issues if you get angry and accuse others of psychological problems over a videogame. Think about it. I have never lost a thing to the New Order. I have no issues with what the New Order does. I have not ever gotten angry in a game. I just find if funny how many Anonymous Agents on this site seem to cry even harder and sweeter tears than the tears which they seek. As for the "ex WoW player" using that makes me just as cool as people using "bot aspirant" or "carebear"
"As for the "ex WoW player" using that makes me just as cool as people using "bot aspirant" or "carebear""
"Awwwwww... it is so cute to see a site totally dedicated to PVP-aspirant former WoW players taking out their childhood bullying issues out on other players." "I have no issues with what the New Order does." By the way, seriously. Keep your judgemental attitude for yourself. People are playing their game, your "mental issues" argument makes you look like a fool. This is a role playing game, no person is harmed. One of CCP's EVE adverts even said "Be the villain: play EVE". Try not to confuse real life with gaming. Peace. "By the way, seriously. Keep your judgemental attitude for yourself." Isn't the Code and this entire site basically judging a sub-set of players in this game for the way they play? "This is a role playing game, no person is harmed"
That is not true. A miner could spend real money on PLEX, sell it for ISK, buy that shiny Orca and get ganked. While stupid and foolish, he or she would actually be harmed, financially. Isn't the Code and this entire site basically judging a sub-set of players in this game for the way they play? " The Code isn't about judging players, it's about improving players by holding them to the prevailing laws and regulations in highsec. "While stupid and foolish, he or she would actually be harmed, financially." If you choose to interpret buying PLEX as financial harm, the financial harm occurs upon the purchase of the PLEX. Trading PLEX for ISK, ISK for Orca, Orca for lossmail; all of those are part of the game and have nothing to do with financial harm--and all occur well after the financial harm. "That is not true. 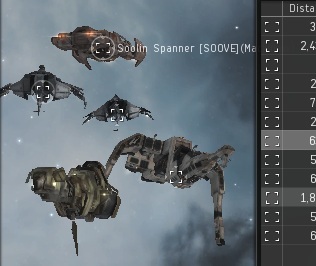 A miner could spend real money on PLEX, sell it for ISK, buy that shiny Orca and get ganked. While stupid and foolish, he or she would actually be harmed, financially." No. 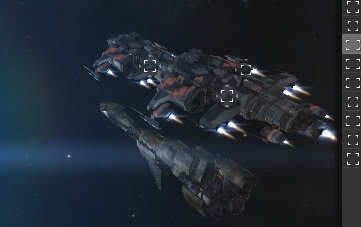 PLEX and ISK are the property of CCP. 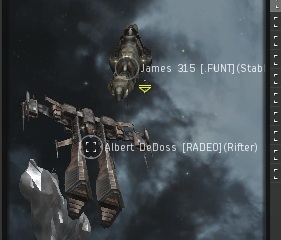 He is financially harmed as soon as he spends real life money (his property) in exchange for a PLEX (CCP's property). The subsequent loss of his in-game assets is not where he is financially harmed. He judged PLAYERS, saying they have mental issues for being part of the New Order. The Code talks about CHARACTERS in a ROLE PLAYING GAME where you can be the ruler of other characters. This is the crucial difference. Carebears attack people behind the monitor, the Code talks about players inside the game. The judgemental attitude is when you judge people's mental abilities, like he did. 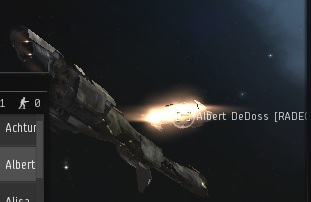 Aldo, when you buy a PLEX you already lost your money, you converted it in virtual money, ISK. What you lose in game is always ISK, so no, in a role playing game no real person is harmed. "First, highsec mercenaries, to the extent that they exist, are all useless." This made me smile. Keep trying to redbox me as I warp to my insta-undock. I figured it was worth a laugh to try and bump you back James, though I have to admit that it was ineffective. In any event, we had better things to do after the initial amusement wore off - which it did pretty quickly. I really don't know how you can spend all day doing that and remain sane. Gratz on the Stabber Fleet Issue. Speedy. Nice gank squads too. CODE. have been pretty effective I see. Counter bumping works pretty much like regular bumping. It looks silly and doesn't work. Bumping inflicts very little economic damage on the miner and is easily rectified. I would say it is a bigger waste of time for the bumper than the bumpee indeed it gives me someone to laugh at while I mine. It is like paying for a personal clown while my other afk mining alts generate me isk.